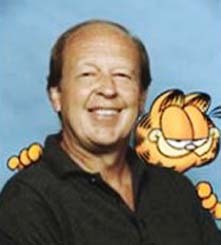 Jim Davis is the cartoonist behind the Garfield marketing phenomenon. He created the "Garfield" comic strip, featuring Garfield the lazy cat, Odie the dog, and Jon their owner. The strip appears daily in thousands of newspapers. Davis grew up on a farm, and says his childhood asthma kept him inside a lot, so to amuse himself he doodled. As a young man, he worked in advertising for two years, then took a job as an assistant to "Tumbleweeds" creator Tom K. Ryan, where he learned the comic strip business. Davis drew his own strip for several years, called "Gnorm Gnat". When that strip was cancelled, Davis drew a giant foot crushing Gnorm. Davis says he studied other successful comic strips, and noticed that they featured lots of dogs, but few cats. That niche was his inspiration for "Garfield", which began its run on 19 June 1978. In 1981, Davis founded Paws Incorporated, a licensing company dedicated to maintaining "the quality of the Garfield character that now appears on thousands of products sold all over the world". At Paws Inc., about 20 artists, along with dozens of animators, audio-video producers and support staff all work under Davis, designing endless Garfield products -- coffee mugs, lunchpails, t-shirts, "collectable" plates, backpacks, video games, bed linen, ad nauseam. Davis says he personally inspects the prototype for each licensed product, no matter how small, even key chains and fridge magnets. In the late 1980s, Garfields with suction-cup feet were omnipresent across America, usually stuck to car windows. Davis says "tens of millions" were sold. In 1998, Davis was inducted into the Licensing Industry Merchandisers Association Hall of Fame. Garfield merchandise is sold in 69 nations. While drawing "Garfield", Davis was also the creative force behind the comic strip "U.S. Acres", and he drew "Mr. Potatohead" when Hasbro offered him comic strip rights to the familiar children's toy. Both strips were syndicated to hundreds of newspapers, but without adequate marketing of collectibles, both faded away. Garfield and Friends, a Saturday morning cartoon, ran on CBS from 1988-94. Garfield has also appeared in several prime time TV "specials", including such classics as Here Comes Garfield, Garfield on the Town, A Garfield Christmas, and Garfield Gets a Life. In 2004 and again in 2006, Bill Murray provided Garfield's voice for movies that featured a computer-generated Garfield, and Jennifer Love Hewitt.